Hey - Tower Records! We all remember that place. We also remember they're explosive collapse, all tangled up with the rise of the internet and MP3s. But is that really the real story behind their demise? 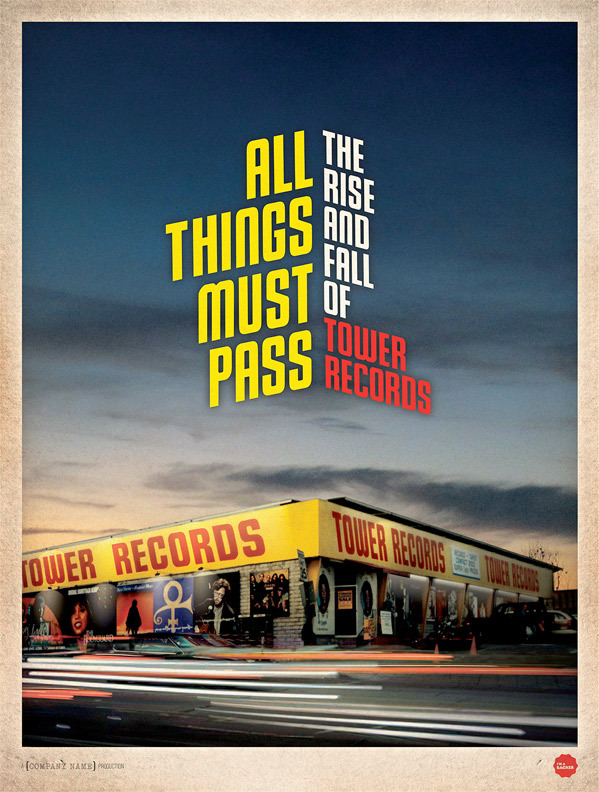 All Things Must Pass is a feature documentary made by actor Colin Hanks exploring the history of Tower Records, focusing on its founder Russ Solomon. This looks like it's an extensive look inside at the real story, as they have tons of archival footage and lots of interviews. I'm very intrigued to see this. And I'm intrigued to see the discussions in it, like the one Dave Grohl mentions about "I don't understand why it's gone…?" Indeed. Synopsis: Established in 1960, Tower Records was once a retail powerhouse with two hundred stores, in thirty countries, on five continents. From humble beginnings in a small-town drugstore, Tower Records eventually became the heart and soul of the music world, and a powerful force in the music industry. In 1999, Tower Records made $1 billion. In 2006, the company filed for bankruptcy. What went wrong? Everyone thinks they know what killed Tower Records: The Internet. But that's not the story. All Things Must Pass is a feature documentary directed by Colin Hanks, exploring the iconic company's explosive trajectory, tragic demise, and legacy forged by its rebellious founder Russ Solomon. The doc opens in select theaters starting October 16th this fall. For more info on the film, visit their official website here. Curious? Looks good. Hopefully it's as good as Sound City. Oh boo hoo, Tower Records was the corporate monster that years ago suddenly popped up and swallowed up all the surrounding independent record stores, at least in my area. Many of us actually cheered when they folded. Still, I'm a sucker for a good music doc (which there have been plenty lately), so I'm sure I'll give this a shot. Never liked tower records. I like my music by my own taste and going into an overgrown warehouse I was not going to pick anything based on their recommendations. LOL...Tower Records was founded in my home city...only went to one in mid-town. I think it was the original. Never liked their stores. Amoeba or Rasputin is way better. Looks like a good watch. I both love and hate the digital age. I miss Tower Records...they had everything, and I mean everything. I bought all 6 seasons of Xena there, all in one night..if they didn't have it they ordered it for you!! R.I.P. old friend.